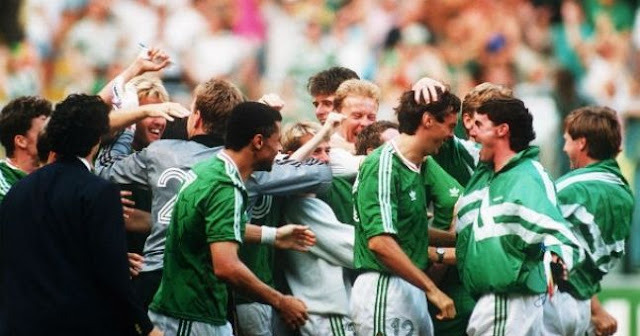 Until Italia 90 the Republic of Ireland had never before qualified for a World Cup Finals, but that summer in Italy they would defy all expectations and progress on to the Quarter-Finals. In December of 1985 former England international Jack Charlton became the first foreigner to manage the Republic of Ireland. 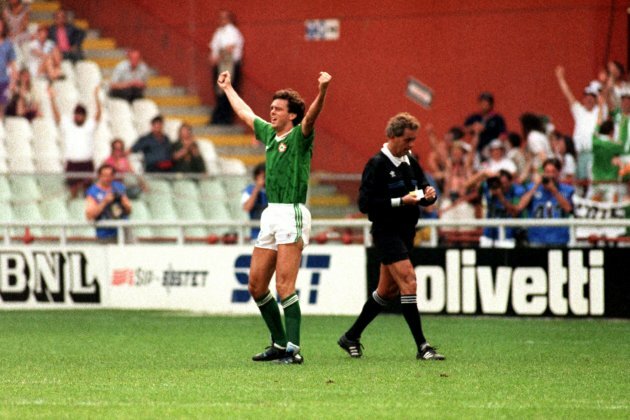 Quickly putting his stamp on the side, and bringing in several talented players who were second or third generation Irish, Charlton fashioned a side that qualified for Euro 88 and, after beating old rivals England in the opener 1-0, were unfortunate not to progress out of the group stage. After securing qualification for the 1990 World Cup in Italy, the Irish found themselves in a group with England again, Egypt and the Netherlands. Dour draws with England and Egypt were followed by a more impressive draw with the fancied Dutch side and a ticket into the Round of 16 after finishing second in the group. On the 25 June 1990 the Republic of Ireland faced off against a classy Romania side featuring among their ranks the dynamic presence of Gheorghe Hagi. After 90 scoreless minutes and a further 30 minutes of extra time played out without a goal the match came down to penalties. 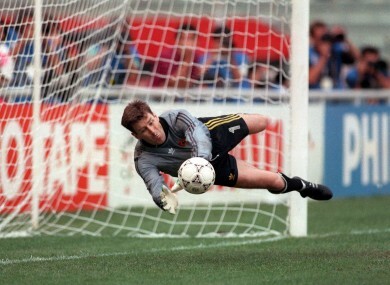 With both sides scoring on their first four kicks, Republic of Ireland keeper Pat "Packie" Bonner dove to his right to deny Daniel Timofte with a fine save and therefore gave his side a chance to progress to the World Cup Quarter-Finals. Up stepped the 32 year old central defender David O'Leary, a calm and classy defender who played out most of club career with Arsenal was not the most likely player you want to take such a crucial penalty. O'Leary walked up to the spot, took a moment to carefully place the ball and then thumped it past Silviu Lung to spark wild parties across Dublin. Unbelievably the Republic of Ireland were through to the Quarter-Finals and a date in Rome with Italy. Before they faced off against the hosts, Charlton fulfilled his promise to take the players to meet Pope John Paul II who gave the squad his blessing. Although Toto Schillaci ended their run in the Quarter-Finals, it was still an incredible run for the side that is still fondly remember 25 years later.